I remember that it was a busy day in the office when I received the email with the sneak preview of the gorgeous campaign snapshots. I was curious about the old hollywood glamour styling juxtaposed with quirky cute and knew that my personal wishlist would be adding a few extra pounds, in the best kind of way! 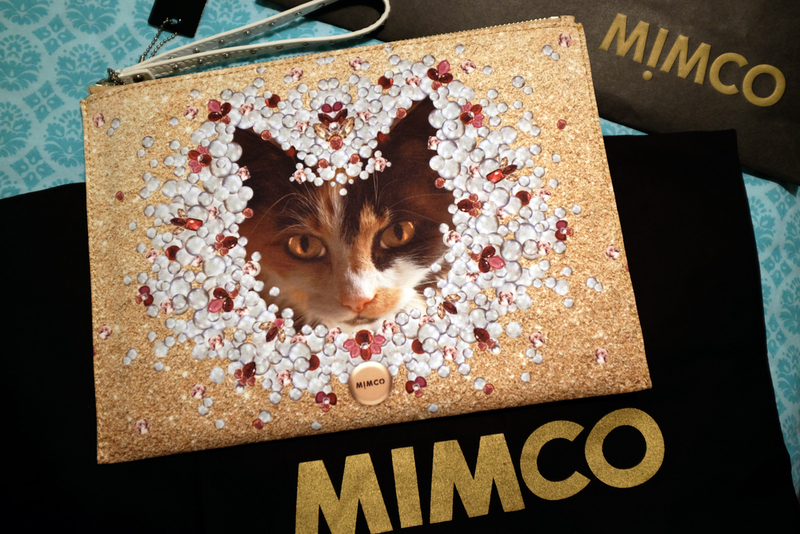 I attended the VIP night at the Mimco Garden City, Booragoon store and was excited to get my hot hands on The Cat's Meow Pouch. I have had my cat eye on this cutie for some time....the hardest part was choosing between the two colours #FirstWorldProblems. I was greeted by a dapper looking man offering me champagne and a cakepop...is this for real? I was very impressed (on a side note: the cakepop was very delicious). I scanned the room and was stamped from all directions with smiles from staff members---what a friendly bunch of peeps. AW14 is a very solid collection that encompassed the Mimco personality while keeping on trend, I highly recommend to visit a store or online and check out the new collections. People anxiously waiting to purchase their wonderful new accessories Champagne and Cakepops served by a well dressed man in an amazing accessory store...what more could a girl ask for? Tan boots making an appearance with plenty of heavily embellished jewellery pieces, yearning to be worn! Decided on the gold colour as it is more versatile for day and night attire Cat Brooch (available here) and The Cat's Meow Pouch (available here) | Meow...Aren't these cat brooches the cutest? Which colour would you pick? Cocoacabana Gem Necklace (available here) The Escapist High Top (available here) | High tops, prevail. It's all about the animal instinct in this collection, I'm a huge fan of the street style look and would love to take these kicks home one of these days.